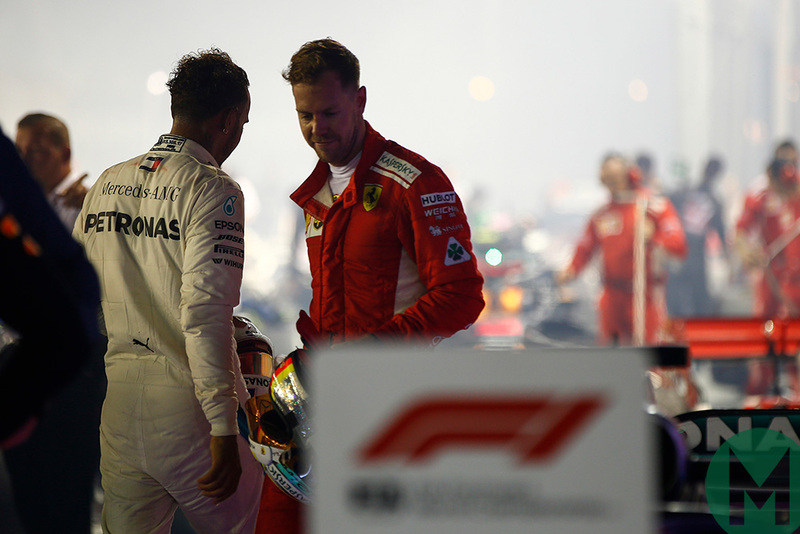 Lewis Hamilton and Mercedes peeled Sebastian Vettel and Ferrari apart again in the Singapore Formula 1 Grand Prix, just as at Monza. In terms of the championship, it’s difficult to see how the Scuderia and Vettel come back from a psychological blow such as this. 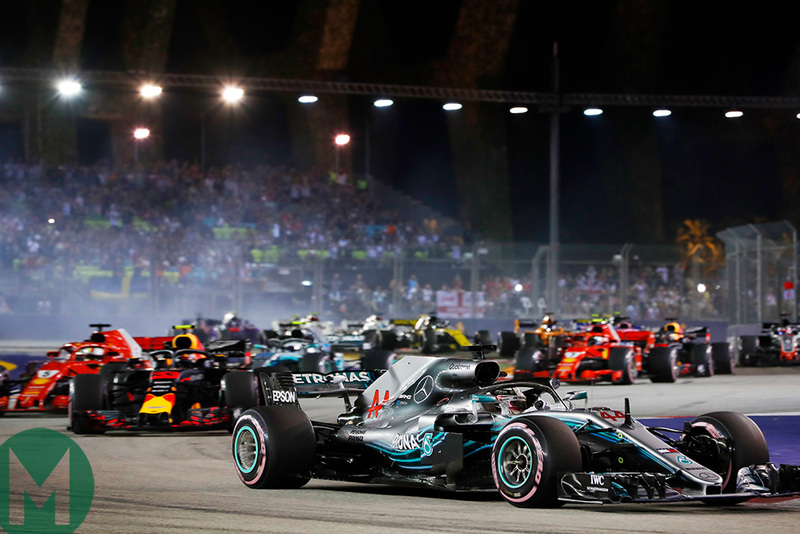 Once Hamilton had capitalised on the collapsing Ferrari with a sensational pole in qualifying – and Max Verstappen had pulled off an equally stunning lap to qualify second – the race was his to lose, and he guarded against that with a drive of technical perfection and control. And Ferrari beat itself. That beating was essentially inflicted on Saturday evening with an extremely messy, somewhat nervy, performance from team and driver. Had Verstappen not suffered a software-induced misfire near the end of his final qualifying lap there’s every chance he could have qualified on pole. And from there the potential to control the race was very clear, given that the hypersoft and ultrasoft combination of tyre compounds made this very much a tyre management race run a long way off the pace and where track position trumped all. So both Ferrari/Vettel and Red Bull/Verstappen could have taken pole – and therefore the victory. But Mercedes/Hamilton did. And they now lead both championships by a handy margin. 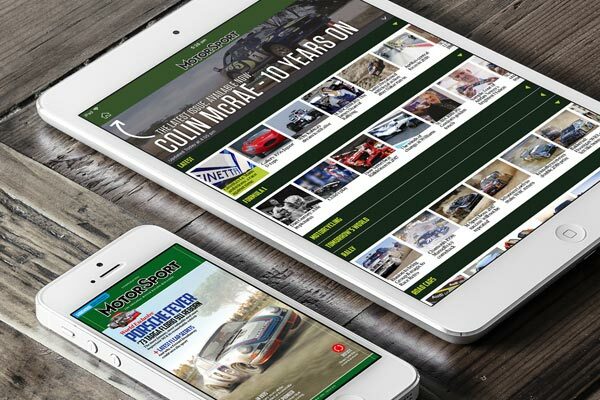 Given that they are consistently winning even on tracks that suit them least and that their surety of operations is of a different order to that of their rival, it feels like the momentum is verging on overwhelming. Ferrari fought as best it could on Sunday to correct what had gone wrong on Saturday, Vettel putting a committed first lap move on Verstappen to take up second place – and the team then doing the only thing it could if it was to have a chance of the win: attempting an aggressively early undercut on Hamilton. But that was foiled by how long it took Vettel to get past Sergio Pérez’s Force India upon rejoining the track, something that not only failed to gain it the lead, but lost second place to the tenacious Verstappen. Pérez played something of a leading role in the race – but not in a good way. After taking out team-mate Esteban Ocon on the opening lap, he later let his frustration at being stuck behind Sergey Sirotkin’s very slow Williams get the better of him with an outrageous piece of wheeled assault for which he rightfully received a penalty. 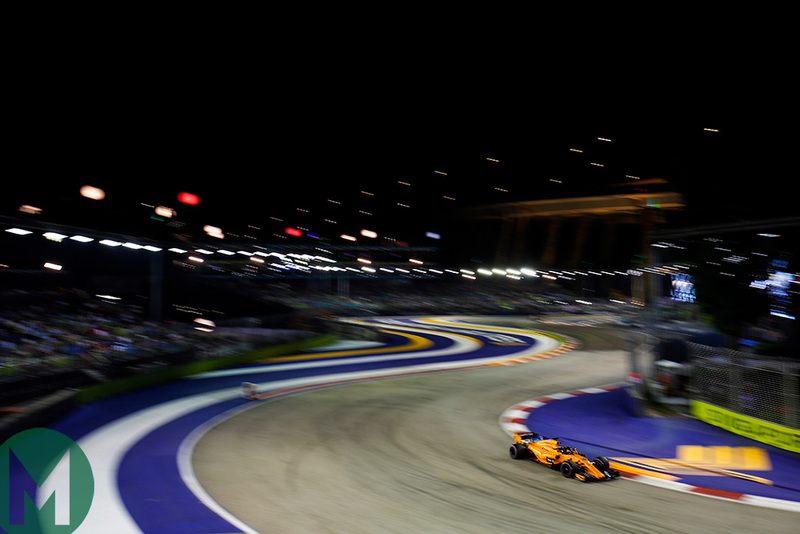 Fernando Alonso gave McLaren its first ‘class B’ victory since Australia after a composed drive that maximised the tyre strategy advantage his qualifying 11th had gifted him on a weekend when that carried extra weight. It was a great lap that Hamilton summoned from the depths of competitive desire, car control, commitment and precision to set pole. 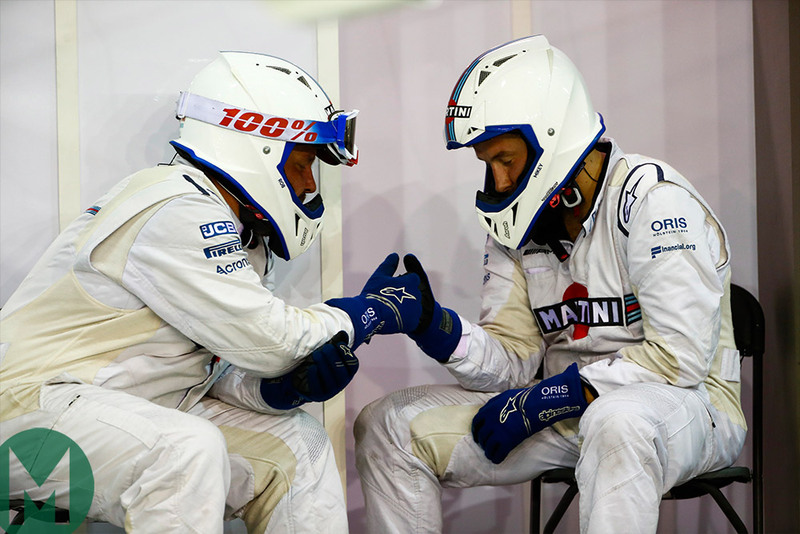 But it was, as Vettel insisted, a beatable time – i.e. Vettel’s Ferrari probably had a faster one within it – but he didn’t access it, because of “the way we composed our qualifying”. The Mercedes, though much better around the team’s bogey circuit than last year (when it had been 0.6sec adrift of pole), still retained strains of its difficulties around this street track with its wide spread of corner speeds, something that tends to catch out the low-rake Mercedes more than the others. So it still required more manhandling than ideal, still had an initial reluctance to turn in to the slower turns and could still snap its rear out angrily on the exits. The Ferrari’s beautiful flow, its stunning rear-end grip, or the Red Bull’s aggressive direction change were something Hamilton and Valtteri Bottas could only dream of. 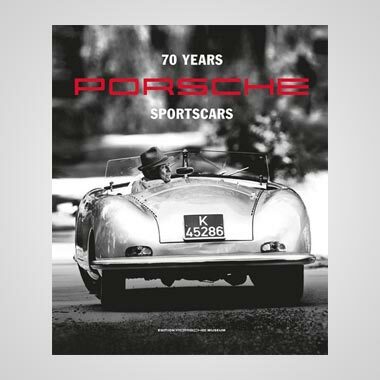 But the silver car could be danced to a decent time if kept within its narrower sweet spot. The team teased the car into that window, and Hamilton danced one of the most beautiful laps he has ever danced. 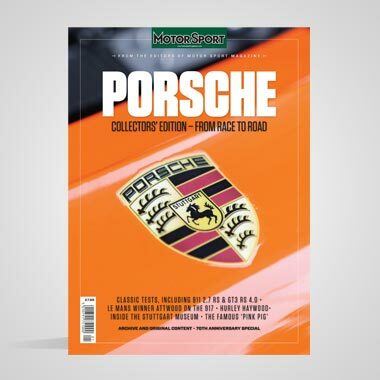 But even that level of personal performance translated into pole only because Ferrari missed its own, much wider, sweet spot by a mile – and because Verstappen’s Red Bull had a persistent misfire and, on one occasion, even a false neutral. Verstappen’s lap was arguably the equal of Hamilton’s (he reckoned it the best he’s ever done) but even the fact that Hamilton was only 0.3sec faster than a misfiring Red Bull supports the contention that the Ferrari could have comfortably eclipsed them both. 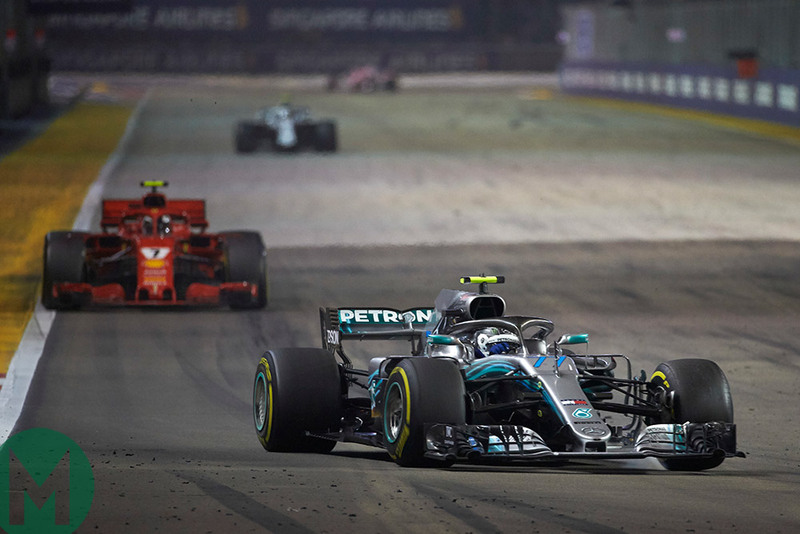 Hamilton’s lap was amazing – for that car around this track, and it was a full 0.7sec faster than team-mate Bottas’ (a similar margin to last year when they were fifth and sixth quickest here). But it would likely have been good only for third had Ferrari and Red Bull been able to maximise their cars. Verstappen was, on the one hand, deeply frustrated with the apparently untraceable engine problem he’d suffered with the Red Bull throughout the weekend, but, on the other, thrilled with his lap. Whenever run on the full power map it would suffer random torque reductions, this in turn triggering an occasional loss of drive. Ferrari found only 0.5sec between Q2 and Q3 (and even that Q2 time was compromised), Mercedes 1.2sec and Red Bull 0.9sec. Partly it was about tyre choice for each of the sessions; partly it was about placement on track relative to other cars. It meant Vettel’s preparation for Q3 – around a track where fine-tuning the feel and confidence between the walls is everything – was disrupted. His first Q3 run was then compromised through being sent out behind Bottas’ Mercedes (and a gaggle of others ahead of it), a car that required a very gentle preparation lap for the hypersoft tyres in contrast to the Ferrari which required an aggressive out-lap. 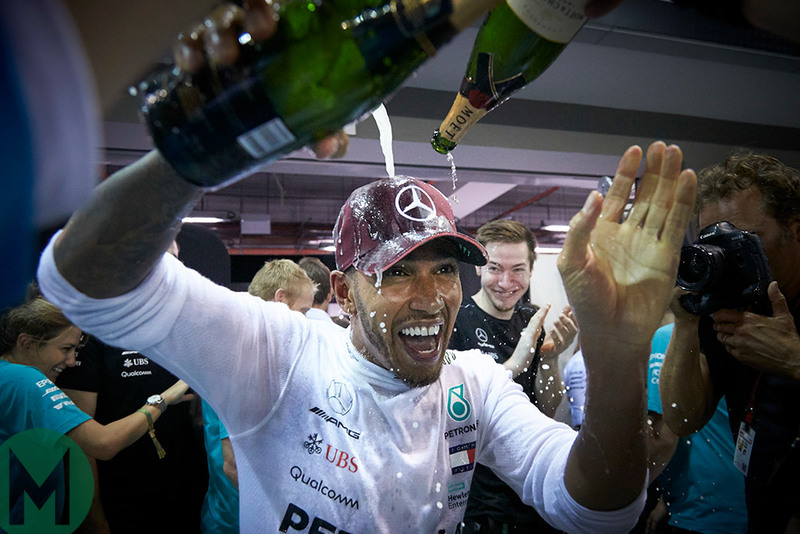 Similarly, Kimi Räikkönen had been sent out behind Hamilton but he was able to pass the Mercedes early in the lap, whereas Vettel was bottled up behind six other cars. “Could I point out that the Mercedes does a slow out-lap and we need a fast one?” said a frustrated Vettel over the radio prior to his final run. “Don’t put me out behind them.” Not for the first time, it seemed he was having to run team operations from the cockpit. Vettel got his clear out-lap for his last run, but the various disruptions meant he hadn’t found his rhythm. He and Räikkönen went third and fifth respectively, separated by 0.1sec. Ferrari seemed to have got wrong-footed by the big gap between the hyper and ultra compounds (almost 2sec) and the quickly evolving track. Mercedes had almost fallen foul of it in Q1 when, using the ultras, it only just scraped into Q2. Despite having just witnessed that, Ferrari sent both cars out in Q2 on the slower tyre. Räikkönen didn’t even bother completing the lap, complaining in exasperation: “The tyre is far too slow,” and coming in for a set of hypersofts. 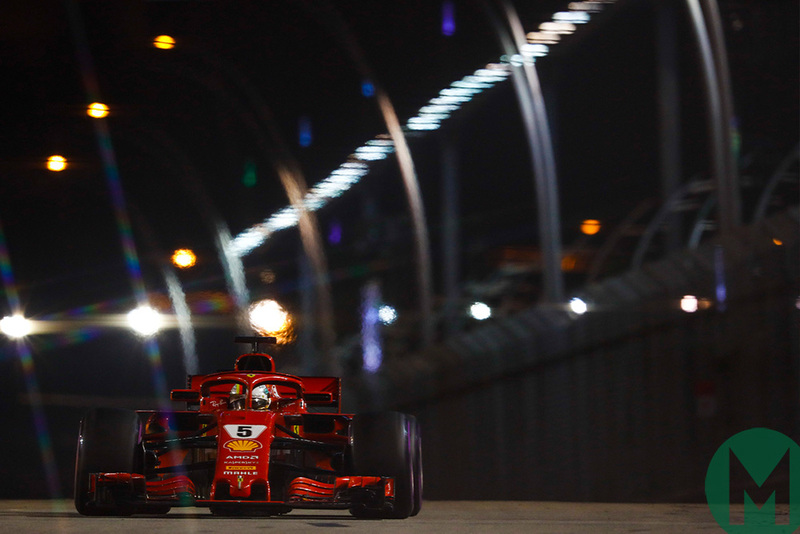 But now that he was out there – and looking ahead to the length of the first race stint – Vettel was all for persevering with the slower but more durable ultra. “What time do I need?” he asked after being advised to abandon. Upon being told he needed a 1min 38.1sec to be sure of clearing the cut-off, he was adamant it was an achievable time. ‘No. Come in,’ the team insisted. 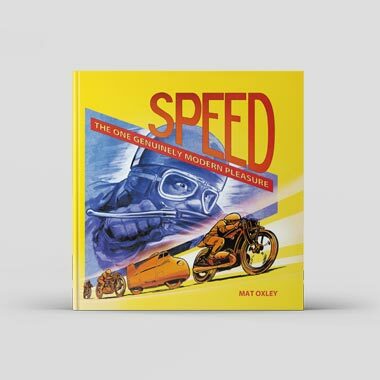 He did so and – even though his subsequent hypersoft lap was badly traffic-compromised – he was comfortably through, albeit no longer with a potential strategy advantage. Räikkönen meanwhile had gone fastest on his single hypersoft Q2 lap, 0.1sec clear of Verstappen and a couple of tenths ahead of the Mercs. These thoughts were reflected by sixth-fastest Daniel Ricciardo. He’d been nip and tuck with Verstappen until Q3 but ended up 0.7sec off. “Everything we changed seemed positive and I thought we would get quicker and quicker as the track evolved, but we just lost pace as the session went on. I don’t have any answers as to why that happened yet which is pretty frustrating. I honestly thought we had a really good chance of a front row and in the space of an hour we lost a second to our competitors. Even with two attempts in Q3 we just couldn’t improve,” said Ricciardo. Sergio Pérez put the extensively updated Force India on the ‘class B’ pole, in seventh, a useful chunk faster than ninth-fastest team-mate Esteban Ocon. Between them was Romain Grosjean’s Haas (the sister car of a bewildered Kevin Magnussen, 1sec slower and unable to get out of Q1). Nico Hülkenberg got the Renault into Q3 but couldn’t match his Q2 time. Carlos Sainz was finding oversteer in the sister car and was 0.3sec slower, in 12th. Fernando Alonso’s McLaren missed Q3 by 0.1sec and lined up 11th. He’d been 0.8sec ahead of team-mate Stoffel Vandoorne in Q1. The Saubers of Charles Leclerc and Marcus Ericsson were marginally faster than Pierre Gasly’s Toro Rosso in Q2. Joining Magnussen and Vandoorne in exiting Q1 was Brendon Hartley, and bringing up the rear were the Williams of Sergey Sirotkin and Lance Stroll. Pink sidewalls beneath the floodlights and the skyscraper backdrop. The colour denoted the rare appearance of the hypersoft (last seen in Montreal). Its traits made it the dominant factor of the whole weekend, something that determined the sort of race it was. Sixty-one laps around the equatorially hot and humid street track was a strategically awkward number for those starting on this tyre – i.e. all of the top-10 – that was reckoned good for not much more than a dozen laps. Because the hardest of the available tyres (the soft) was slow and the middle compound (the ultra) was marginal to complete the distance, it meant the quickest way to run the race was to drive slowly. So the pack would circulate in a train, a sort of high-speed Monaco, as the hypersoft runners tried to eke out the stint length to make the one-stopper feasible. With a long, slow pitlane (60kph limit), the pitstop loss of 28sec made two-stopping too costly. 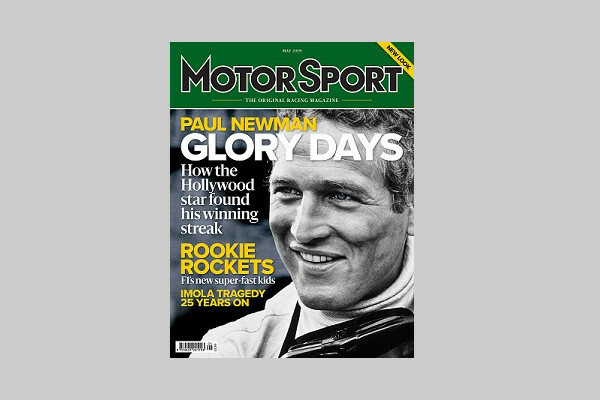 Defending from the undercut was going to be especially tricky because the temptation would be to switch to the soft in order to be sure of getting to the end – but the soft likely wouldn’t have the out-lap performance to leapfrog the rival on the old hypers. So the undercutter would probably need to fit the ultra and then manage the pace once track position was established. Even more than usual, the first lap was critical. Hamilton surged the long silver machine into an immediate lead as Verstappen and Vettel ran each other wheel-to-wheel, the Red Bull aggressively down the inside of the Ferrari, Vettel locking up briefly in reluctantly surrendering the place into the first turn. Bottas just edged out Räikkönen and Ricciardo. Grosjean opted for the inside escape lane unforced, obliging Pérez to park the Force India on the apex to keep the Haas behind. Trying to take advantage of their resultant loss of momentum, Ocon tried for the outside of them through turns two-three. It was a vulnerable place to put himself against a team-mate with whom he has a history – and Pérez was totally uncompromising with how he dealt with it, allowing his outside wheel to thump the other car hard, putting Ocon hard into the barriers, right-front wheel bent forlornly back. “I think it’s best I don’t comment,” was all Ocon later allowed himself to say. 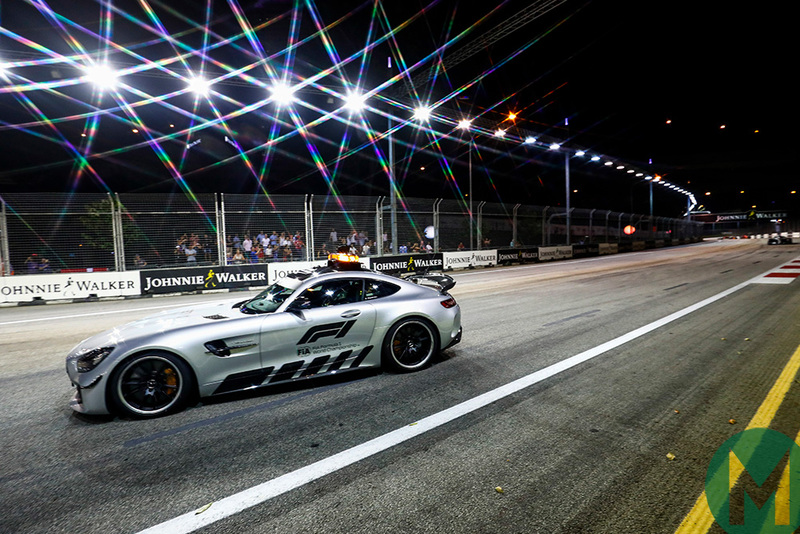 A safety car was inevitable, but not until after the action up Raffles Avenue through the kink of Turn Six and into the braking zone of the right-angle of Turn Seven had played out. Vettel was using the Ferrari’s greater power to slipstream Verstappen through the kink, using everything the battery had to give as he guided his wheels inches away from the Red Bull’s. It was a tough, no-nonsense move and seemed to indicate that Vettel was in no mood to settle for damage limitation. He’d just completed the manoeuvre into second when the safety car was made official. Behind Pérez and Grosjean ran Alonso (first of those on the ultras), Sainz, Hülkenberg, Gasly, Leclerc, Ericsson, Magnussen, Hartley, Sirotkin, Vandoorne and Stroll. 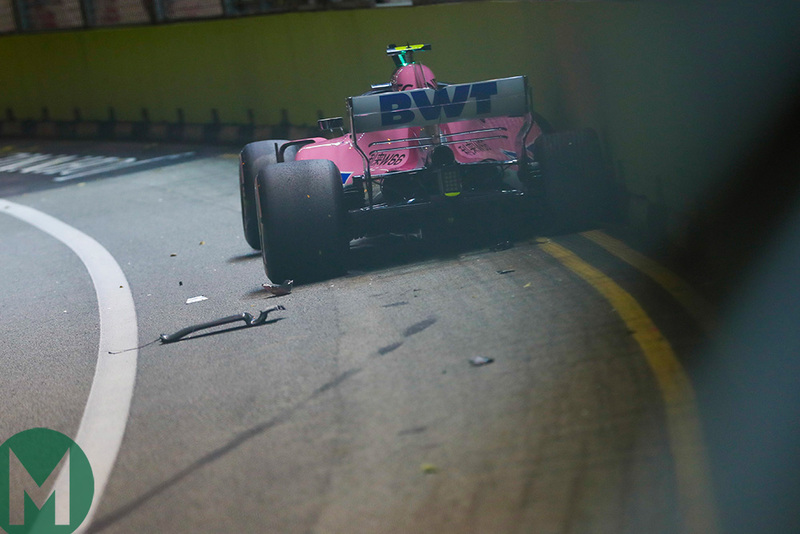 Sirotkin’s car had caught a bit of Ocon’s wheel rim in its front wing and pitted to have it removed while switching to a set of the softs with the aim being to run to the end. The Williams were hopelessly off the pace, more so around here with its myriad turns than on more conventional tracks – and this would come to have a significant impact upon the race. After the debris was cleared and the broken Force India taken away on the back of a truck, the safety car came in. This had conveniently extended how far through the race it was possible to take the hyper – but it was still going to be a challenge. Hamilton, knowing the Ferrari needs a hard preparation lap to get its tyres up to temperature, held the pack at a very slow pace before sprinting easily away. Thereafter, the racing settled down to around 3sec off the possible pace so as to achieve the desired stint lengths. Verstappen was relieved just to be back at any sort of racing speed, for the Renault engine continued to splutter and stutter on part-throttle. Anything less than a peak revs upchange would see a big torque reduction, but Verstappen was managing to improvise his way around it. For the next few laps there was the appearance of a race; in fact it was just a phase of tyre conservation. At some point Hamilton would have to make a break for it before the pitstop window opened, in order to be out of Vettel’s and Verstappen’s undercut range. He began to let rip on the 12th lap, upping his pace by more than two seconds (giving some indication of how artificial the previous pace had been). Vettel gave chase but, with tyres that had spent some laps in air a lot more turbulent than that enjoyed by Hamilton, didn’t have quite as much in hand. This allowed the Mercedes to pull out the gap to more 2sec. Verstappen upped his pace too, but not by as much as either the Mercedes or Ferrari. The plan was to run longer, hoping to take advantage of the Red Bull’s gentler tyre usage to get later onto a fresh set. At Ferrari it was time to go aggressive. Before too much longer Hamilton was going to be in range to clear seventh place Pérez in the first of the ‘class B’ cars. If Ferrari was going to beat Hamilton to the pitstop draw, it’d need to do it before quite having the pitstop gap over the Force India, then hoping Vettel could pass it immediately. But, as recalled, the undercut would probably not work if it put on the soft tyre rather than the ultra-soft – because taking a time to heat up, it would not immediately be faster than Hamilton’s worn hypersofts, which would make it possible for Mercedes to pit a lap later and still come out ahead. So it would have to be the ultra for Ferrari, which would necessitate a very long second stint. A couple of seconds after Hamilton surged through the fast final corner on lap 14, the Ferrari peeled off into the pitlane. A new set of ultrasofts were fitted in 2.7sec and Seb was underway again, rejoining the track a few seconds behind Pérez but travelling much faster. Hamilton responded with an in-lap 1.3sec faster than Vettel’s had been and while Mercedes fitted his new softs in 2.9sec, Vettel had not managed to pass Pérez. The Force India was fast down the straights and, as we’d already observed, Pérez wasn’t in a charitable mood. Ferrari’s determination to throw caution to the wind, trying to conjure a victory from the compromised position its recent operational errors have put it in, had ultimately led to a further loss. Räikkönen was kept out until the 22nd lap, comfortably clear of Ricciardo who, with no undercut threat behind him, was playing a softly-softly game so as to be able to get onto ultras for the final stint. He pitted for these on lap 26 and rejoined back at the tail of the three-team group of six, but on faster tyres. A similar game was playing out in ‘class B’ where the two leaders – Pérez and Grosjean – were disadvantaged compared to the nearby Alonso and Sainz in having started on hypers. Grosjean had been pressuring Pérez’s position as the pit window approached but neither of them had a pitstop’s worth of gap to the tail end (on account of the slow pace and consequent lack of field spread) and neither did the other hyper-shod Q3 qualifier, Hülkenberg, a few places back. But, with their hypers wilting badly, they had no choice. Hülkenberg, Grosjean and Pérez came in on consecutive laps from the 15th to 17th, rejoining in the order of Pérez, Hülkenberg, Grosjean. This trio was now consigned to the slow pace of Sirotkin’s Williams – allowing the yet-to-stop ultra-shod Alonso and Sainz (and later Leclerc) to comfortably pull out a pitstop’s worth of gap. The McLaren and Renault now headed the unofficial class as the Force India and Haas paid the penalty for having qualified in Q3 and fell ever-further out of the picture as Sirotkin held his ground. Pérez’s day was not going well and Sirotkin was doing a perfect defensive job, without error, in a slow car on old tyres, sitting it on the apexes, bringing Pérez’s speed down to his, then gunning down the straights, keeping the door closed approaching the braking zones. “This is unacceptable,” complained Pérez, for the benefit of race director Charlie Whiting. But it was difficult to know what race control was supposed to do – Sirotkin, having not lost too much time to the pack by pitting under the safety car, was racing for position in a slow car and doing an excellent job of it too. Just ahead of him was the yet-to-stop Stroll in the sister car. Gasly and Leclerc were having a close dice a few seconds back from ‘class leaders’ Alonso and Sainz. The Toro Rosso had started on the hypers even though it wasn’t required to and eventually they began to wilt. 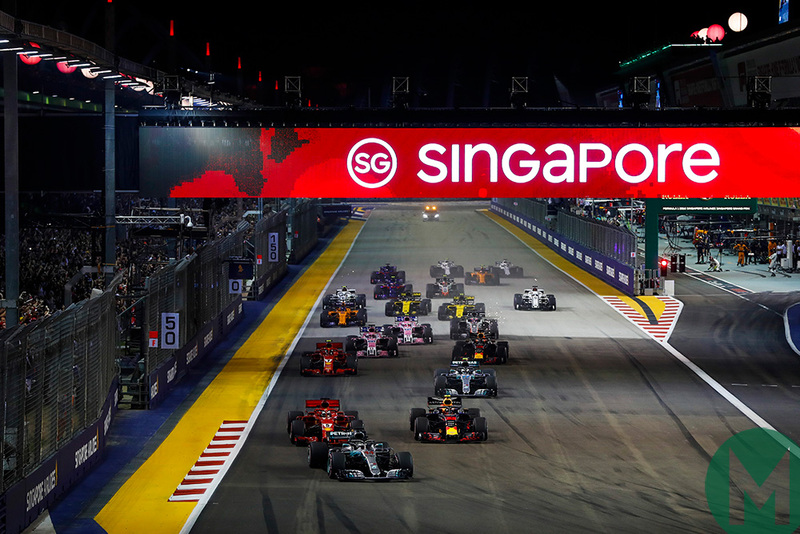 Into the Anderson Bridge on the 26th lap, Gasly locked up, pulling him off-line and allowing the ultra-shod Leclerc to smartly position the Sauber to drag ahead on the entry to the Esplanade straight. Toro Rosso immediately called Gasly in, but that placed him near the back of the Sirotkin-led train, directly behind his earlier-pitting team-mate Hartley. Right at the back was Magnussen, who’d pitted to anticipate a Vandoorne undercut threat that never materialised. With the hyper-shod ‘class B’ drivers all forced to pit before they’d cleared Sirotkin, the Williams split that unofficial category into two as Alonso, Sainz, Leclerc, Ericsson and Vandoorne pulled away and the others remained bottled up behind. 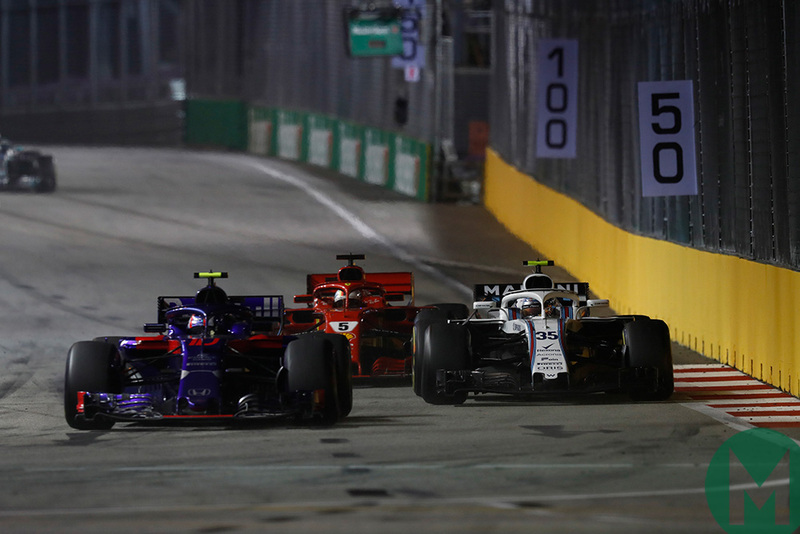 There was a five-car queue lined up behind Sirotkin as the leaders began to catch the tail of the field. Eventually, Pérez made a desperately late lunge past Sirotkin on lap 33, briefly got ahead into the right-handed Turn 11, only for Sirotkin to retaliate down the inside of the left-handed Turn 12. They went through side-by-side, with the Force India having more momentum on the exit, but the Williams placed for the inside of the next left-hander. Before it could play out, Pérez simply turned sharp left into the other car in an apparent fit of frustrated road rage. 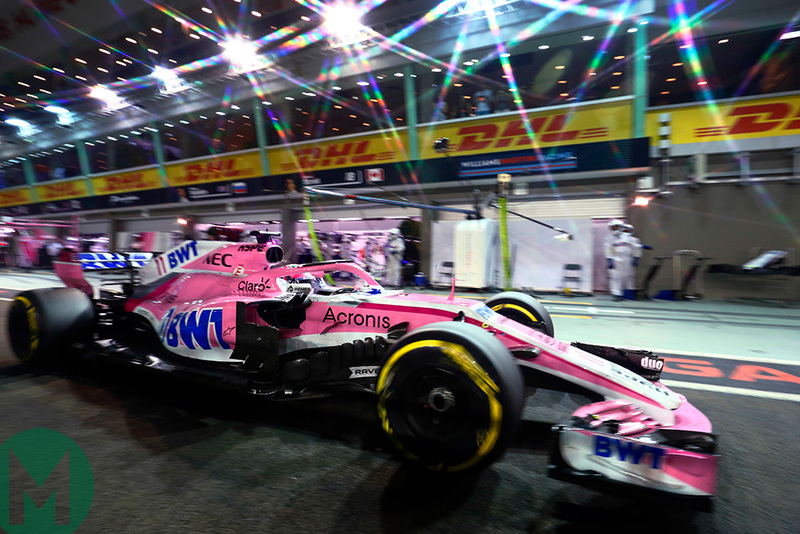 The Force India punctured and limped to the pits; the Williams took extensive floor damage and was passed by Hülkenberg and Grosjean – just as the leaders were approaching. For the first time since the start of the race, the outcome seemed in doubt. In coming through the traffic Hamilton had lost most of the 5sec he’d led Verstappen by and now as they caught Sirotkin into the Anderson bridge at an awkward place, Verstappen was trying to pounce. Hamilton had to get defensive on the Red Bull while simultaneously forcing past the Williams. He managed it all perfectly, but it had been a close squeak. As Verstappen was then delayed lapping Grosjean, so Hamilton eased out a breathing space once more. Grosjean would later be awarded a 5sec penalty to be added to his time for ignoring blue flags. Pérez would be given a drive-through penalty for his collision with Sirotkin – and might be considered lucky not to have picked up a ban. As Sirotkin desperately continued defending in his now-crippled car, so he resorted to running out Hartley to the edge of the track by not turning in. 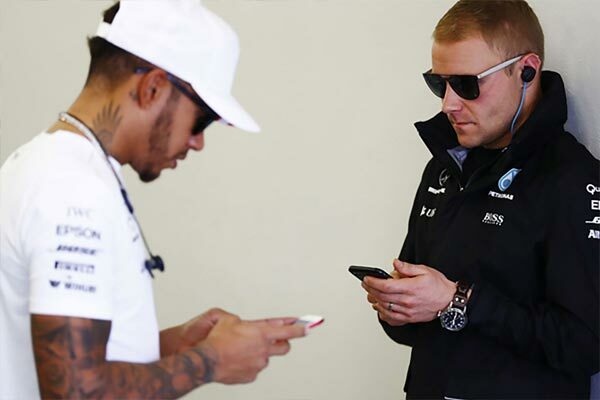 This would get him a 5sec penalty – taken at the pitstop that was finally deemed necessary to replace the worn tyres. It left him right at the back, but it was a performance that lacked nothing in determination. Vettel’s ultras had given their best earlier than the softs on the cars of Hamilton and Verstappen and so his engine was turned down, he dropped away from the Red Bull, and just maintained station, around 12sec clear of Bottas who spent many laps keeping the closely-following Räikkönen under control. Ricciardo, on his newer ultras, set a few fast laps to close up to the back of that group before the rubber had given its best and he settled into a sixth-place finish, rather overshadowed by the thrusting performance of team-mate Verstappen. Alonso was a comfortable ‘class B’ winner in seventh, albeit the McLaren was almost a lap down. But he had beaten Sainz’s works Renault fair and square. Leclerc and Hülkenberg took the final points, with the late-stopping Ericsson maintaining the upper hand over Vandoorne. Gasly in 13th was left rueing having started on hypers and finished only a few seconds clear of Stroll. Magnussen, with nothing to lose, pitted for a late set of hypers – and proceeded to set the race’s fastest lap, underlining just how gentle the pace had been. Perhaps it wasn’t the most intense of races, but the win was essentially secured through the magical manipulation of the no44 car in the final moments of qualifying, when the neurons and elastomers met to move the dynamic weight from wheel to wheel in a special way. That, and the grind of a development programme, made possible a win from pole at the team’s bogey track.